Rely on our rock-solid reliability…and relax! Here at Carbon Sales, Inc., a new year often heralds innovative and exciting developments as we dedicate ourselves once again to continued business growth and improvement. Today, we’re pleased to announce the launch of this new website! In the months and years to come, we plan to use both the website and our new Blog to keep you up to date on products, processes and people! We currently offer over 300 specifications of Anthracite Filter Media and can custom-blend product to meet your individual needs. As we add even more standard specification sizes, we’ll post about them here. If packaging or shipping options change, you’ll be the first to know about it. Manufacturing a high quality product like Anthrafilt is only the first step. It doesn’t do you any good if a supplier can’t get it in your hands reliably and responsibly. 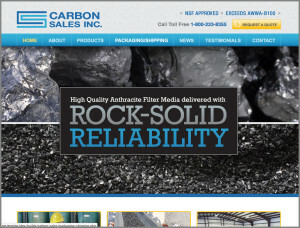 That’s where Carbon Sales, Inc.’s expertise and commitment distinguishes us from our competitors. Nobody will work harder to get you exactly the product you need, when you need it, and where you need it. Nobody. © 2014, Carbon Sales, Inc., All Rights Reserved.